Home Horses The Arabian Breeders' Magazine: The Breeders Interview - Georgian Arabians, UK. The Breeders Interview – Georgian Arabians, UK. 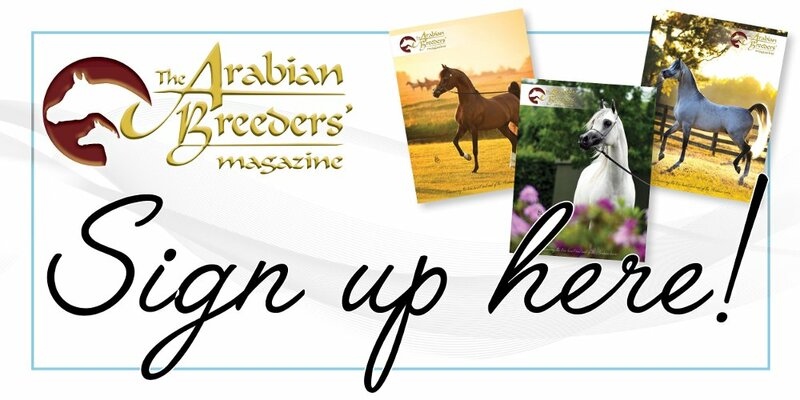 The Arabian Breeders’ Magazine (TABM): Please share with our readers a short background of your farm. Susan George, Georgian Arabians, UK: Georgian Arabians began its life as a hobby shared with my late husband, Simon MacCorkindale. It was originally born out of my love of all horses. 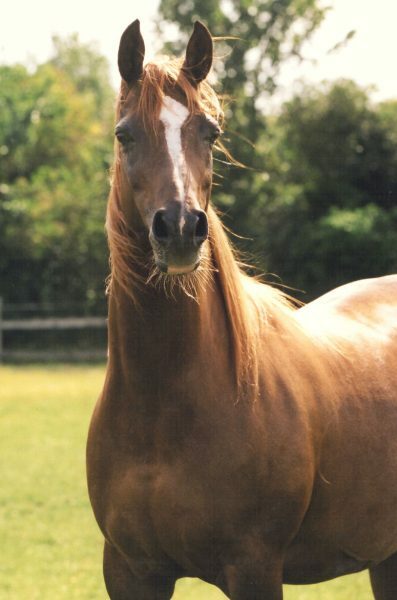 However, the purchase of the 68% Crabbet/Polish-bred mare Luzhana (Rezolute Bay x Ludora) fanned the flame of an even greater passion for the Arabian breed and Luzhana became the foundation mare for an innovative breeding programme that has recently celebrated 21 years. What began as a stable yard with a few pet project horses has, over time, evolved into the highly acclaimed enterprise of Georgian Arabians Stud Farm, home to some of the finest world-class pure-bred Arabian horses. Essteem (Fame VF x Espressa). Credit Susan George. 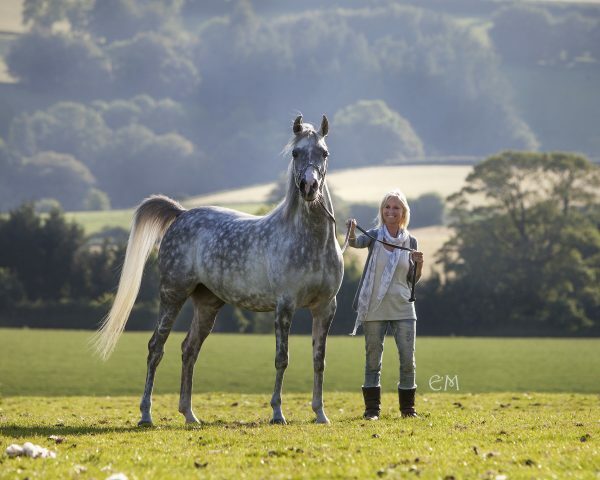 Susan: My breeding programme has been mostly El Shaklan (Shaker El Masri x Estopa) related with the later introduction of Ali Jamaal (Ruminaja Ali x Heritage Memory) and Padron Psyche (Padron x Kilika). In the early days, Simon bought for me my very first stallion, the incomparable Russian /Egyptian racehorse Artist (ex Stihia by Topol), a son of the legendary Aswan (Nazeer x Yosreia). Artist sired some amazingly powerful sport horses as well as the very special show mare, G Baryshnia (ex Buhara by Moment) who achieved incredible acclaim for our farm in the early years. Artist was the King of Georgian Arabians until he died at the grand old age of 32. I must mention the magical mare Halina Shaklana, a Hagunia (Jabalpur x Iama by Tabal) daughter by Kerrilyn Ibn Amir (Amir El Shaklan x T Naazifah), who produced such a successful long line of Spanish/Egyptians for Georgian Arabians. 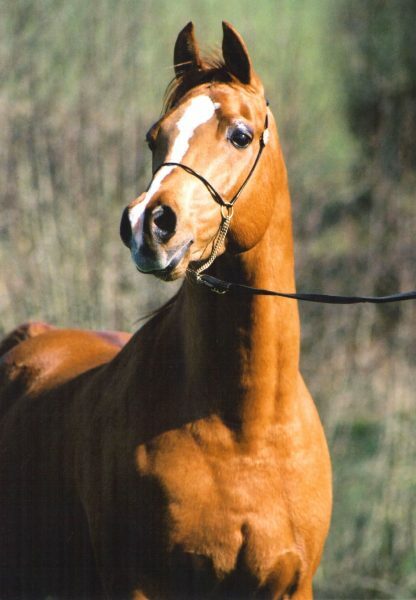 Her daughter and successor Haiti Shaklana (by MA Alishah by Ruminaja Ali) was the best producing mare of all and dam of our wonderful SG Vienna Image (by SG Imagine by WH Justice). 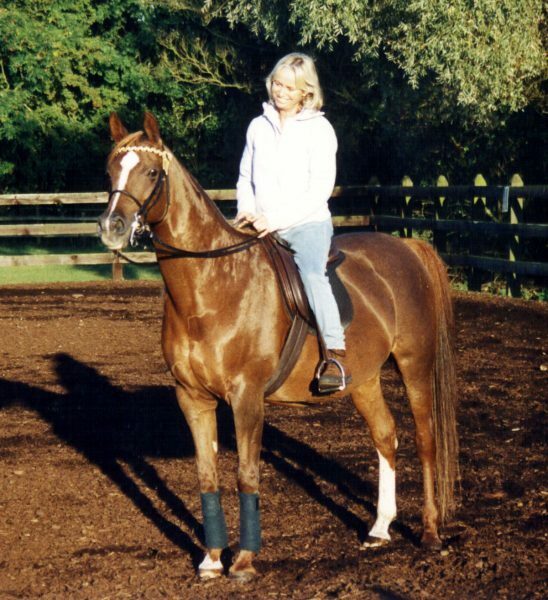 Susan with Essteem (Fame VF x Espressa). Credit Georgian Arabians archives. 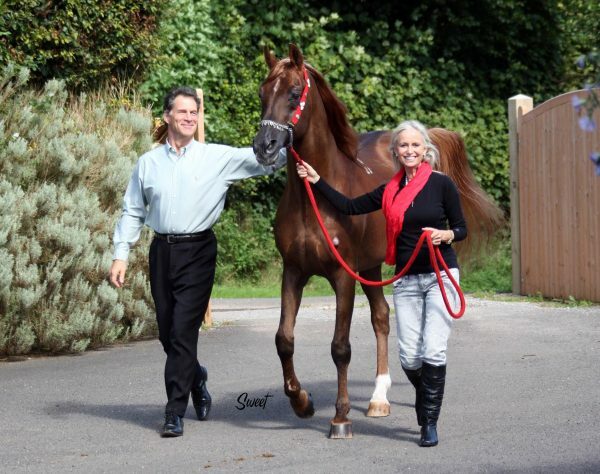 We leased World Champion Stallion Essteem from La Movida Arabians in the year 2000. He was to become the cornerstone of a remarkable and influential breeding line. At this point, I had a string of beautiful mares with a mix of family bloodlines from Polish to Russian to Spanish. Essteem was bred by Doug Damen out of his gorgeous El Shaklan daughter, Espressa (ex China Moon by El Hilal) and sired by Fame VF (Bey Shah x Raffoleta-Rose). 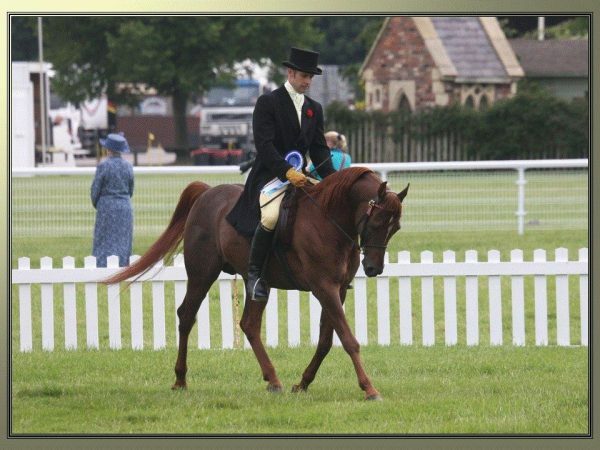 Unbeaten in the show-ring, Essteem took up residency at Georgian Arabians for two years and left us with an impressive legacy. I don’t have enough applauding comments about this stallion, a magnificent example of the best of the breed; substantially made, with a strong, well-muscled body and excellent limbs, and not forgetting his kindness of nature. For me, although in essence he had won his titles for his exemplary beauty, it was his structure that first caught my eye as well as his faultless enigmatic presence my heart. He remains the one horse that, when he showed off, could easily bring me to tears. Luzhana (Rezolute Bay x Ludora) – Reserve Supreme British National Champion with Jo Woodward. Credit Georgian Arabians archives. Susan: I am by no means a follower of fashion and I have strong conviction in my ideals. I look for good structure and bone, practical engagement, and usability in the horses I breed. Kindness of temperament is also of paramount importance. ‘Type’ in the world of today has most certainly changed dramatically from years gone by, and extreme everything is the fashion of the moment. While I adore the look of chiselled accentuated features, there are many other attributes that need to compliment. Essteem produced strength and power in all offspring: handsome heads, gorgeous eyes, strong backs, strong bodies, plenty of bone, and movement like no other. Years later, my plan was to search for a special stallion to add refinement and along came WH Justice (Magnum Psyche x Vona Sher-Renea)! When I first saw this stallion’s exquisite beauty, I was mesmerised and in a heartbeat, he was the chosen one. There is no perfect horse and if he had a weakness, it was in strength of body, but he made up for that in every other way and the five mares I selected to use him on, I believed could compensate. 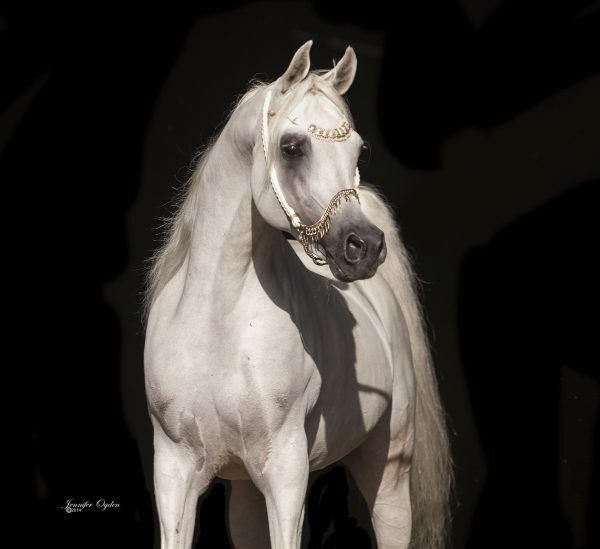 The combination of this remarkably refined stallion and the homebred Essteem daughter SG Hessta Shaklana (ex Halina Shaklana by Kerrilyn Ibn Amir), with all of her sire’s best attributes, produced Georgian Arabians’ premiere stallion SG Imagine. Among other titles, SG Imagine was awarded the United Kingdom’s most prestigious prize, that of British National Champion Stallion in 2012. Luzhana (Rezolute Bay x Ludora). Credit Scott Trees. Susan: The cross of Luzhana with Ibn Estasha (Malik x Estasha) produced my very first homebred boy that I called Luzhanas Stargazer; shows how much I knew about the Arabian showing world, when I named him. Not exactly following tradition or trend! ‘Sparky’ was his pet name and he was the one that everyone came to know. 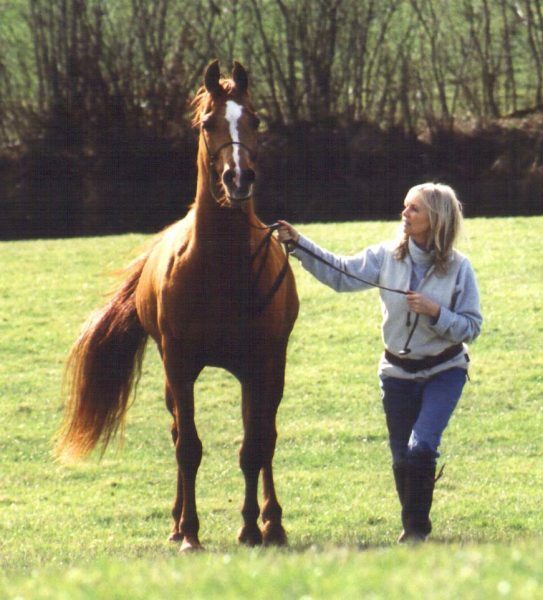 In his early years, Silverdale Arabians in the UK were an amazing support for my induction into the Arabian showing world, and Rebecca Carr showed our pride and joy to perfection in halter classes. I remember vividly arriving at shows where we came third, fourth, fifth and sixth and at the time, it seemed more exciting to Simon and I than any Oscar! I admit it took a few years to realise that Sparky was all the more suited to a life under saddle. Which latterly he proved, big time, winning a populated gelding class and going on to become Horse of the Year Show Reserve Champion in 2004. Luzhana (Rezolute Bay x Ludora) and Susan riding. Credit Georgian Arabians archives. Susan: When I could see a stamp in our homebred horses that reflected my vision and others could see it too. I remember hearing someone say at a show that they recognised a type of well-bodied horse, they must have been bred at Georgian Arabians, and it thrilled. Longevity, I think, defines a breeder, as does staying power and commitment to ones personal vision, values and belief. Although I never forget that while I’ve been breeding for 21 years, there are others who have been doing so for a lifetime and I’ll always value experienced opinions and will always be open to learning more. SG Imagine (WH Justice x SG Hessta Shaklana by Essteem). Credit Jennifer Ogden. Susan: It would be good if private breeders were celebrated and given more opportunity to exhibit their successes, and I imagine only at international shows could that be achieved. In reality, very few people are genuinely interested in the success of others. It’s a competitive world and the horse world is no exception. 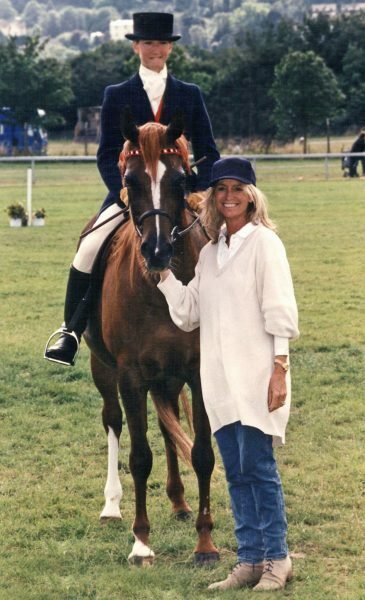 It used to make us smile when Simon and I were showing horses; we didn’t always win but were excited for others when they did and always congratulated, which seemed to surprise! SG Spirit of Essteem (Essteem x Malikeh El Sakeena). Credit Georgian Arabians archives. Susan: I hope not, obviously, but there is a huge divide between smaller farms with smaller breeding programmes and the large, extremely successful operations, where everything can be achieved in the best way, rather than just affordable. When I came into the industry, there were very few trainers with their own farms, and good breeders were truly valued for their exciting horses that trainers looked forward to showing. Nowadays, most trainers have an agenda and can cherry-pick horses that are almost certain to win for their clients; no seconds or thirds are an attractive option, and money plays a huge part in the proceedings. You can also see how much harder it has become for trainers at times and that’s sad, that the pressure and strain to be at the front of the line is of such tantamount importance to their businesses that consequently, its overtaken the happiness and heart element that used to be there. Simon and Susan with Artist (Aswan x Stihia). Credit Sweet photography. Susan: Dedication comes with any career choice and as I’ve been dedicated all my life to first one career and then another, I only know and thrive on dedication and commitment. Susan: Twenty British National Championship titles. A friend of mine a few years ago was eager to point out that in 18 years of showing horses, Georgian Arabians has that many British National Champions in ridden and halter classes as well as two Champions at the Horse of the Year Show, the most prestigious of all breed horse shows in the United Kingdom. Susan with G Baryshnia. Credit Sweet Photography. TABM: And finally, what is next for you and your breeding programme? 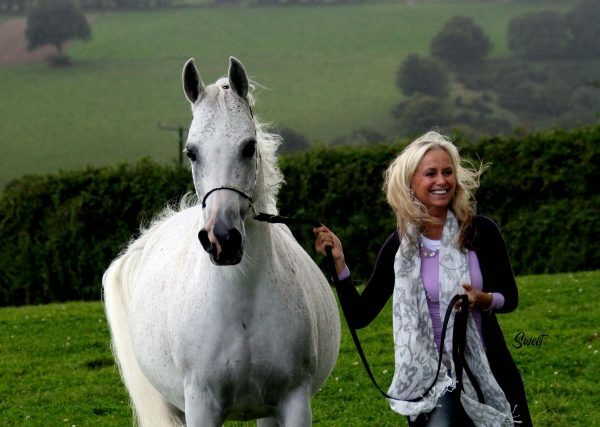 Susan: I am a perfectionist and always believe that there is so much more to do and achieve but my overpowering love for the Arabian horse, knowing them at work and at play, as I have for many years, makes me feel, they owe me nothing and I owe them everything. I honestly believe I have a few World Champion contenders in our barns, if we want to pursue the showing route. However, as many people know, there are changes afoot in my life at present and a resurgence of my former career in film, has somewhat taken precedence in my every day life. So, loving them will be the most important part of my immediate future. The 2007 mare SG Matisse (WH Justice x Malikeh El Sakeena). Credit Emma Maxwell. In continuing to breed, my focus is very much on the performance Arabian and the Essteem son SG Spirit of Essteem (ex Malikeh El Sakeena by Maleik El Kheil). He not only became a Grade One endurance horse himself in 2015, but also his son SG Elegant (ex Egala by Grandorr) completed the FEI Young Horse World Champion Endurance race in the South of France in October. His sire, Spirit, will be standing at stud next year and I will continue to breed with him and SG Imagine for specific purpose, but in a very much smaller way. 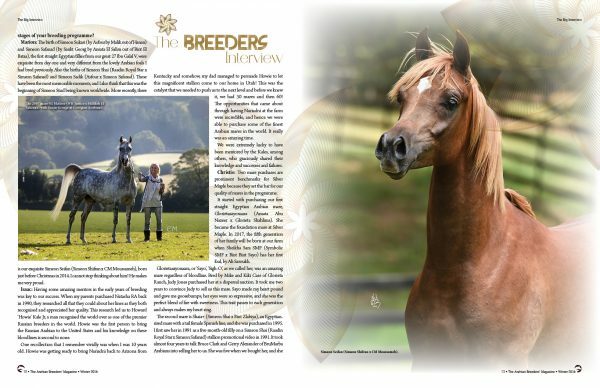 First printed in The Arabian Breeders’ Magazine Volume I Issue II December 2016. To enjoy further content such as this, please visit The Arabian Magazine Shop.